Today I am sharing an unboxing of a My Thrill Club box. I had seen it advertised on Facebook and saw it was inexpensive for what you get. $14.99 for either two books and a dvd or two dvds and a book. Yep, that is all it costs! The books are also hardback by the way! I figured that the movies and books themselves may be older, so there could be a chance you already own them, But the cost is just awesome, so I decided to give it a try! I did the live unboxing on Bookies as usual. 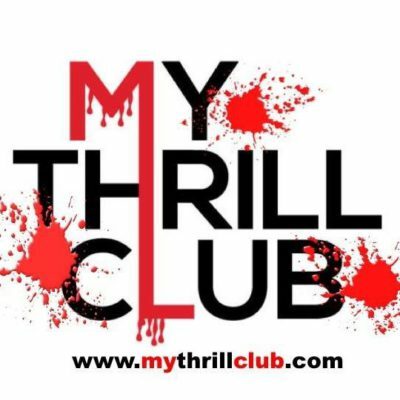 **My Thrill Club only ships to the US and Canada. You pay an additional $10 for shipping to Canada. Surprise Me- this could be any of the three genres that arrive to you! Sage wanted the box all to herself! The letter that came. OMG, my box was packed by It! A Clown!!! Here is the first book! OMG, not only is it a hardback…. It is signed too! That was very unexpected! That is a win for the box right there! It is December 6, 1941. America stands at the brink of World War II. Last hopes for peace are shattered when Japanese squadrons bomb Pearl Harbor. Los Angeles has been a haven for loyal Japanese-Americans—but now, war fever and race hate grip the city and the Japanese internment begins. Perfidia is a novel of astonishments. It is World War II as you have never seen it, and Los Angeles as James Ellroy has never written it before. Here, he gives us the party at the edge of the abyss and the precipice of America’s ascendance. Perfidia is that moment, spellbindingly captured. It beckons us to solve a great crime that, in its turn, explicates the crime of war itself. It is a great American novel. Here is the movie that was next. It was wrapped in plastic, so it was new! That answered my question on if the movies would be new or used! Two London brothers are hard-up for cash, and both have girls to look out for, too. When rich Uncle Howard comes to town and agrees to help them out, he admits his finances are under investigation, and he asks them to do him a favor and “take care of” an old business relation to keep his trouble under wraps. I was very pleased with this box! I did not own any of the items that came. There are no extras, but come on…. $14.99 is a DEAL for two hardbacks and a dvd! I will be getting this box again next month, so I will have another unboxing for you. I did get an email saying that the February box will be the last box to include dvds; from now on there will be a ‘surprise gift’. I’m not sure if this box is January or February as I ordered it right at the end of January. I suppose we will see when the next box arrives! I love how they have the thriller/horror theme and keep it throughout! My Thrill Club box is recommended!